Adiponectin, a protein secreted from adipose tissue, is an insulin-sensitizing, anti-inflammatory, and vasculoprotective cytokine which has been shown to improve glucose tolerance and insulin resistance in humans.7 It was demonstrated by previous reports that adiponectin protects against the development of kidney stones.3,8 Obesity was shown to have associated with lower adiponectin in earlier studies along with high rate of urolithiasis, due to changes in the composition of urine favouring stone formation.9−12 Even though the prevalence of kidney stones is increasing in DM, the mechanisms that link the two morbidities were not fully explored till now. Hence, the present study was designed to assess the serum levels of adiponectin and insulin resistance in DM patients with urolithiasis in comparison to those without. This case control study was conducted in the Department of Biochemistry, Jawaharlal Institute of Postgraduate Medical Education and Research (JIPMER), Puducherry, in collaboration with the Department of Urology, JIPMER, during 2013−2014. Ethical approval was obtained from the Institute Ethics Committee (no. IEC/SC/2012/4/103). The study protocol conformed to the ethical guidelines of the Declaration of Helsinki and written informed consent was obtained from all the study subjects. (n = 30), the control group, included DM patients without urolithiasis who were matched for age and gender with the first group. The patients were on treatment with oral hypoglycemic drugs for a period of five to 10 years. Patients with obstructive uropathy, ureteric colic, renal failure, inflammatory and infectious diseases, malignancy, and ischemic heart disease were excluded from the study. Diabetic patients taking insulin were also excluded. After obtaining written informed consent, clinical and anthropometric parameters of the study subjects were recorded. A 5 mL of blood was drawn from the antecubital vein after 12 hours fasting and was processed for biochemical analysis. Routine parameters like fasting blood glucose level, urea, and creatinine were estimated immediately. Serum was separated and stored at -80 0C for further analysis of other biochemical parameters. Insulin and adiponectin levels were estimated using commercially available enzyme-linked immunosorbent assay kits. A 24-hour urine sample was also obtained from the subjects after proper instructions. Twenty-four hour urinary levels of calcium and phosphate were also estimated in an autoanalyzer using reagent kits. Statistical analysis was performed using SPSS Statistics (SPSS Statistics Inc., Chicago, US) version 16. The results were expressed as mean ± SD and/or as median and range. The comparison of biochemical parameters between the study groups was carried out using independent Student t-test and Mann-Whitney U test for normal and non-normal distributed data, respectively. The correlation between insulin and adiponectin was tested by Pearson’s correlation. A p-value of < 0.050 was considered statistically significant. The study included 60 patients and the patients were divided into two groups. Group A consisted of DM patients with urolithiasis (n = 30), and group B as the control group with DM patients without urolithiasis (n = 30). The serum adiponectin levels in group A were significantly increased compared to the control group. However, no significant difference was seen in serum insulin, HOMA-IR, blood glucose, urea, and creatinine between the groups [Table 1]. Table 1: Comparison of BMI and various serum parameters between groups A and B.
BMI: body mass index; SD: standard deviation; IQR: interquartile range; HOMA-IR: homeostasis model assessment of insulin resistance. Table 2: Comparison of 24-hour urine parameters between groups A and B. *Denotes p <0.050. **Denotes p < 0.001. Group A cases showed a significant (p < 0.050) increase in the levels of 24-hours urine sample calcium and phosphorous compared to the control group [Table 2]. In the present study, we obtained a negative correlation between adiponectin and insulin among the cases (r = -0.368, p = 0.045) [Figure 1]. The correlation between adiponectin and HOMA-IR was not statistically significant (p = 0.077). 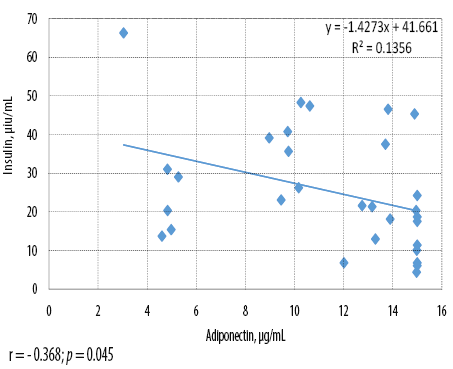 Figure 1: Scatter plot showing correlation of adiponectin with insulin in diabetes mellitus patients with urolithiasis. Adiponectin has renoprotective, anti-athero-sclerotic, anti-inflammatory, and antioxidative function.16−19 In our study, patients in group A have a significantly higher serum adiponectin levels. The mechanism for the increased levels of adiponectin in group A patients compared to group B is unclear. A previous study shows that adiponectin has a renoprotective role by inhibiting inflammation and apoptosis.8 Thus, the increase in adiponectin may be a compensatory mechanism for preventing further progression of urolithiasis and onset of its complications by improving insulin sensitivity. This might be the reason for trivial significant difference in the levels of insulin and HOMA-IR between the two groups in our study. The serum adiponectin levels was increased in group A patients. However, future studies involving larger number of subjects are needed to confirm the protective role of high adiponectin against the disease progression. The authors declared no conflicts of interest. This study was funded by the JIPMER Intramural Research Grant. An abstract of this research was published in the Indian Journal of Clinical Biochemistry Vol: 30, Supplement 1, December 2015 as part of the abstract of 42nd National Conference of Association of Clinical Biochemist of India (ACBICON 2015). We would like to thank JIPMER, Puducherry, India for funding this study. Curhan GC. Epidemiology of stone disease. Urol Clin North Am 2007 Aug;34(3):287-293. Chou YH, Su CM, Li CC, Liu CC, Liu ME, Wu WJ, et al. Difference in urinary stone components between obese and non-obese patients. Urol Res 2011 Aug;39(4):283-287. Ando R, Suzuki S, Nagaya T, Yamada T, Okada A, Yasui T, et al. Impact of insulin resistance, insulin and adiponectin on kidney stones in the Japanese population. Int J Urol 2011 Feb;18(2):131-138. Mahmoudabadi MM, Rahbar AR. Effect of EPA and vitamin C on superoxide dismutase, glutathione peroxidase, total antioxidant capacity and malondialdehyde in type 2 diabetic patients. Oman Med J 2014 Jan;29(1):39-45. Sakhaee K, Adams-Huet B, Moe OW, Pak CY. Pathophysiologic basis for normouricosuric uric acid nephrolithiasis. Kidney Int 2002 Sep;62(3):971-979. Abate N, Chandalia M, Cabo-Chan AV Jr, Moe OW, Sakhaee K. The metabolic syndrome and uric acid nephrolithiasis: novel features of renal manifestation of insulin resistance. Kidney Int 2004 Feb;65(2):386-392. Kadowaki T, Yamauchi T. Adiponectin and adiponectin receptors. Endocr Rev 2005 May;26(3):439-451. Fujii Y, Okada A, Yasui T, Niimi K, Hamamoto S, Hirose M, et al. Effect of adiponectin on kidney crystal formation in metabolic syndrome model mice via inhibition of inflammation and apoptosis. PLoS One 2013 Apr;8(4):e61343. Awad M, Rahman B, Hasan H, Ali H. The Relationship between Body Mass Index and Periodontitis in Arab Patients with Type 2 Diabetes Mellitus. Oman Med J 2015 Jan;30(1):36-41. Al-Hamodi Z, Al-Habori M, Al-Meeri A, Saif-Ali R. Association of adipokines, leptin/adiponectin ratio and C-reactive protein with obesity and type 2 diabetes mellitus. Diabetol Metab Syndr 2014 Sep;6(1):99. Taylor EN, Curhan GC. Body size and 24-hour urine composition. Am J Kidney Dis 2006 Dec;48(6):905-915. Siener R, Glatz S, Nicolay C, Hesse A. The role of overweight and obesity in calcium oxalate stone formation. Obes Res 2004 Jan;12(1):106-113. Li WM, Chou YH, Li CC, Liu CC, Huang SP, Wu WJ, et al. Association of body mass index and urine pH in patients with urolithiasis. Urol Res 2009 Aug;37(4):193-196. Powell CR, Stoller ML, Schwartz BF, Kane C, Gentle DL, Bruce JE, et al. Impact of body weight on urinary electrolytes in urinary stone formers. Urology 2000 Jun;55(6):825-830. Taylor EN, Stampfer MJ, Curhan GC. Diabetes mellitus and the risk of nephrolithiasis. Kidney Int 2005 Sep;68(3):1230-1235. Lihn AS, Østergard T, Nyholm B, Pedersen SB, Richelsen B, Schmitz O. Adiponectin expression in adipose tissue is reduced in first-degree relatives of type 2 diabetic patients. Am J Physiol Endocrinol Metab 2003 Feb;284(2):E443-E448. Ouchi N, Kihara S, Funahashi T, Nakamura T, Nishida M, Kumada M, et al. Reciprocal association of C-reactive protein with adiponectin in blood stream and adipose tissue. Circulation 2003 Feb;107(5):671-674. Bråkenhielm E, Veitonmäki N, Cao R, Kihara S, Matsuzawa Y, Zhivotovsky B, et al. Adiponectin-induced antiangiogenesis and antitumor activity involve caspase-mediated endothelial cell apoptosis. Proc Natl Acad Sci U S A 2004 Feb;101(8):2476-2481. Yamauchi T, Kamon J, Ito Y, Tsuchida A, Yokomizo T, Kita S, et al. Cloning of adiponectin receptors that mediate antidiabetic metabolic effects. Nature 2003 Jun;423(6941):762-769.